I have a playlist on Spotify that gets shuffled en-route to most rides. Each song takes me around the world - The Bronx's Ribcage to Queenstown with the C3 crew, Pennywise's Peaceful Day to the silty slopes of Mount 7 for Psychosis or Rob Zombie's Dragula to Sam Hill slashing dusty corners in Western Australia. Each one getting me ready to attempt my best impression of their protagonists. Mountain biking has rhythm, beats and flows in a similar way to music and, for most of us, the two are fairly intertwined. Jeff Warren, a professor of music at Quest University, Squamish, is starting a research project into the links between mountain biking and music that he is hoping to turn into into "at least" a couple of scholarly articles and potentially a book. He began by giving a series of talks on the music in mountain biking videos but has since branched out to thinking about how sound and music affect the way we ride. All of my past research has been about everyday musical experiences that are often overlooked by academics who are looking for really special musical experiences. I wrote a book about Music and Ethical Responsibility and some of my key examples were singing a lullaby to a kid or the experience of performing music and thinking about food instead.I've been now in Squamish for almost six years and as I've become a mountain biker here I began to notice that music plays a pretty important role in everyday experiences of mountain bikers. It wasn't until I had a chance to present at an academic conference last spring (and I was getting tired of the book I was writing) that I said, "well why don't I present on this topic?" I wrote 200 words on it and they accepted it so I had to write some more on it! There are certain sports where the sound has always been important, just think of the quiet surrounding tennis or golf, which is different to the loudness of a football game. There are also definitely influences between skate, snowboard and mountain bike videos. People who make the videos think about the music in them, Pinkbike commenters make all sorts of comments about music in films but there hasn't been any study about how does this show up in mountain biking specifically.People seem to shape their lives around music. Often when we meet somebody might say “what music do you listen to?” and we think we know something about them from the answer. In the same way, we shape our lives around mountain biking. It's important to people's identities and how they spend their time and money. The academic term is 'serious leisure'. So if people do that both around music and mountain biking it's interesting to see when those two things come together. Yeah, the film I ended up with in the presentation was the Peter Wojnar's, Flow Up, Slow Down. It was actually that video that made me think, “there's something there, I need to do something on this”. There’s now so much variety and so many ways that film makers are working with the music, it's not just the guitar based punk/thrash stuff of the 90s or the kind of Art of Flight electronic music that's been transposed into mountain biking. 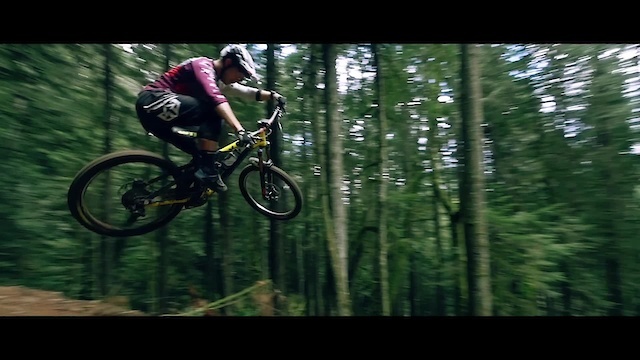 It seems that mountain biking edits are coming into their own, filmmakers are really thinking about what music can match with different types of mountain biking. You still see the thrashy stuff but you see hip hop, you see classical music, you see folk music and what I find interesting is that in all of these different edits, there's some sort of parallel between how it's shot and what music is chosen. The ones that really emphasise a rider doing something that's really difficult still seem to have really high energy music, whether that's electronic or hip hop or guitar based punk stuff. But in the Peter Wojnar film there's almost as many shots of the forest as there are in the rider and that seems to be paralleled in this music that's kind of folky and kind of electronic. I think that the sport definitely has come into its own, there have been reports in the Sea to Sky area here about just how much riding has grown in the past ten years and that there are over ten million mountain bikers in the US alone. Then also the way that people consume and produce mountain bike media has given the media producers a little bit more freedom and flexibility to try out new things with a wider audience. Also the technology of making edits is more accessible now than it was 20 years ago.I guess the other thing is that we do consume music differently than we did in the 1990s, when it was CD and album based, to the wide variety of music that we can consume by using a Spotify playlist or by using an algorithmic approach. As a researcher I'm interested in what's there in the video and the variety of ways people respond to it. I pulled out the Scott Secco comment that said this was the greatest mountain bike video of all time, which is upvoted more than a thousand times. People like that video and there seems to be that several reasons why.People either seem to point to the riding or the film techniques but I think that a video that really connects with somebody is one where someone could almost imagine themselves wanting to be the rider, especially if you are a mountain biker. This edit seems to capture something about what mountain bikers want to be like, to be able to ride that smoothly, to be able to drive to the middle of nowhere to have a perfect trail. You hear all these sounds leading up to the point where Semenuk puts on his helmet and goggles and then all the other sounds disappear and he's off into this other world. That is where the music just takes over and the smoothness of the music seems to match the smoothness of the riding. Of course, other people might disagree and not like it because it's not gnarly enough or they think mountain bikers destroy the environment and don't connect to nature or maybe they don't think that this is a proper use of this song. So I'm interested in the variety of different views that people have. I found that if you go to Pinkbike there's often a lot of discussion on what makes the edit good or doesn't make it very good. I see a lot that are of the sort that "hit mute on the video and then the film is really good." Bikes are different with all the technology and we have opinions about, for example, whether hubs should be silent or they should sound like Hope hubs and be loud and prominent. There's also something interesting in the Semenuk Raw 100s that by listening to the sounds of the bike and putting those in front, it points us towards parts of what the rider is doing. It's sometime hard to see if a rider is scrubbing a roller or not but if you can hear the scrub happening, the sound points you to that. I do think we have had this movement over the past two years where we value the raw sound. But, of course, it's not the sound of what you or I hear when we're riding because we hear mostly the wind whipping past our ears or breathing heavy. It’s this idealised soundscape in the same way that playing Buffalo Springfield is creating an idealised soundscape through music. I want my tyres to rip those corners like the sounds I hear in those videos, they don't, but it becomes this ideal that can then actually shape the way that I go about and ride a trail next.Once you watch enough of those it can start to shape the way that you see that trail and the way you want to interact with it and I think that's what's really interesting about it. Films first try to capture the experience that we have mountain biking but then they also shape the way that people go about and think about biking. It's a co-constitutive relationship - each informs the other, I think that is interesting. There's a whole bunch of research into music and athletic performance, some of it's really good but some of it is problematic. There's this popular concept that certain types of music will do something predictable all the time. In the early 90s there was the concept of the Mozart effect - you listen to Mozart and it makes you smarter. That went all over the media and went crazy but it was a scientific study that never got replicated. Some of those assumptions have made their ways into scientific studies but there are so many issues in that because we all have different musical preferences, even listening to the same piece of music doesn't have the same response. There's lots of interest in the topic because athletes in all sorts of sports use music to help their performance and feel like music does help their performance but there doesn't seem to be any predictable way it does so. I often don't listen to music, the practicalities of all the wires and headphones stop me from doing that. Also because I have a world that's surrounded by music and I don't mind taking time away from that to take in the sounds of the trails. I've tried all sorts of things like doing longer races and trying to listen to low tempo music to keep my heart rate down to see if that would work. I also tried listening to the Bon Iver song [from Speed Up, Flow Down] and riding Half Nelson and I loved listening to it but I came to the parking lot and there were some people there just at their cars looking at me really funny. It's because I had a stick in my derailleur and they had heard me coming down the last ten turns but I had music in my ears and didn't hear a thing!